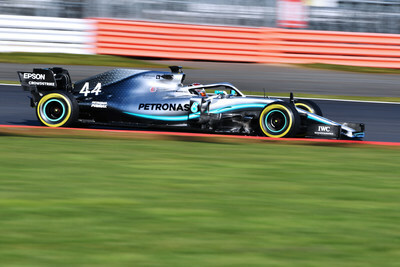 PHILADELPHIA, March 13, 2019 /PRNewswire/ -- Axalta (NYSE: AXTA), one of the world's leading global suppliers of liquid and powder coatings, has developed a new luxurious, dynamic, stunning pearl PETRONAS green for Mercedes-AMG Petronas Motorsport. 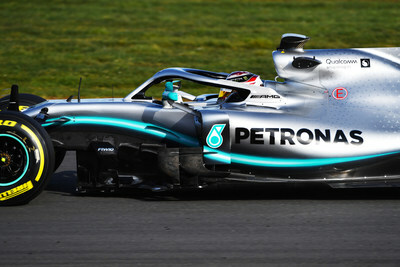 The new PETRONAS green color features prominently in a stunning glow line that runs the entire length of the Mercedes-AMG F1 W10 EQ Power+ race cars – from the front wing to the rear wing. The glow line has two different concentrations of the new PETRONAS green either side of a bright, white stripe giving an impressive and striking effect, on and off the track. "We wanted a PETRONAS green to pop on camera, from every camera angle, even from the roving helicopter shots overhead at races. 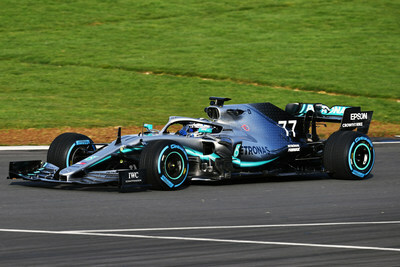 But we also wanted to make sure it was just as technologically innovative, providing the same level of durability, resilience and ease of use as the other Axalta products we've used for the last five years," says Andrew Moody, Head of Paint and Graphics for Mercedes-AMG Petronas Motorsport, at the team's Paint Shop in Brackley, England. Wade Robinson, Axalta's Director of Motorsports, says, "Axalta's involvement in Formula OneTM underscores the success of our decades-long racing partnerships in the US, Europe, Asia, and Latin America. And while developing a new color isn't easy – you have to take into account the complexity of the livery, the different painting processes, and focus on performance and precision - we are delighted the outcome has met the brief so perfectly." "It's through these racing relationships we demonstrate our industry-leading technology and innovative products, while strengthening our commitment to racing of all kind, including major series like NASCAR, WEC and Formula Student racing," Robinson concludes. For more information about Axalta, please visit www.axalta.com, and to find out about Axalta's involvement in motorsport, visit www.axaltaracing.com. Axalta is a leading global company focused solely on coatings and providing customers with innovative, colorful, beautiful and sustainable solutions. From light OEM vehicles, commercial vehicles and refinish applications to electric motors, buildings and pipelines, our coatings are designed to prevent corrosion, increase productivity and enable the materials we coat to last longer. With more than 150 years of experience in the coatings industry, the 14,000 people of Axalta continue to find ways to serve our more than 100,000 customers in 130 countries better every day with the finest coatings, application systems and technology. For more information visit axalta.com and follow us @Axalta on Twitter and on LinkedIn.